iPad 2018: The iPad for the masses! Apple’s iPads are maybe the most used tablet out there. It appeals to everyone and it gets the job done. Whether you are an adult or a child, whether you use your iPad for work purposes or just for entertainment, an iPad is something everyone can find useful. From the elderly to the young, iPads have become a common device in everyone’s household. While an iPad can be used for just about everything these days, it has become something that everyone can use. Apple is now releasing another iPad without any number to follow this time. Coming as just iPad, this iPad has much of the same features as before, with the same size, weight and look to it. But as with everything new, there are a few features here and there that come in addition to the same old features. Otherwise how would you justify bringing in a new model when the old model is just as good. Just like previous models, the iPad 2018 looks just like last year’s model. It has the same 2048 by 1536 pixel resolution, the same 9.7 inch display screen, with the same old bezels and the same old touch sensor in the same old place- the home button. Looking at the physical dimensions, that is also the same 9.4 by 6.6 by .29 and if you’re wondering about the weight, well surprise surprise it’s the same- just over a pound. The iPad with no suffix as called by Apple and the iPad 2018 as called by me, is available in 32Gb or if you have a bigger wallet 128 Gb of internal storage. Comparing both models you will not see any noticeable difference, it’s just the same. The cameras too have not undergone any change since the last year, with the rear-end camera being an 8Mp camera with a f/2.4 lens and with 1080 HD video recording. The front facing camera in the iPad 2018 has a 1.2Mp camera and a f/2.2 lens with 720 HD video recording. 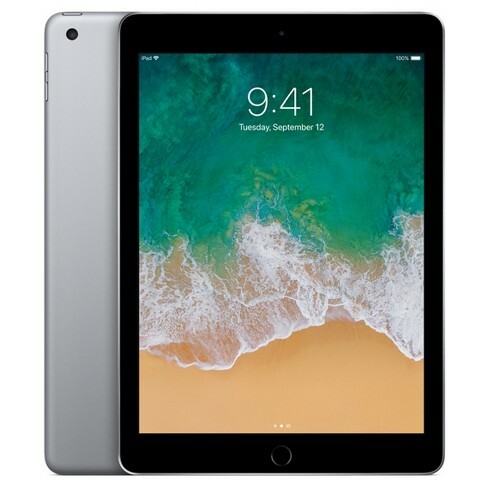 Besides all the other specs, the iPad 2018 also has Wi-Fi and 4.2 Bluteooth connectivity and a choice of 4G LTE cellular radio for use with GSM or CDMA networks. Coming to the battery the iPad 2018 comes with a 32.4 watt lithium polymer battery that lasts for 10 hours. While the speakers and the home button placement remain all the same in the iPad 2018. Finally, what’s new in the iPad 2018? All new iPads come with an upgraded processor, this time around is no different either. The iPad 2018 comes with a A10 Fusion chip which is the same as in the iPhone 7 and iPhone 7 plus. This time, you can use the Apple touch sensitive pen with the iPad 2018, which in the past was only available to the higher end iPad Pro line- up. Finally the price, the iPad 2018 will come at $329 for the 32Gb model and $429 for the 128 Gb iPad 2018 model. If you want to add LTE to the mix, then add $130 to the bill.